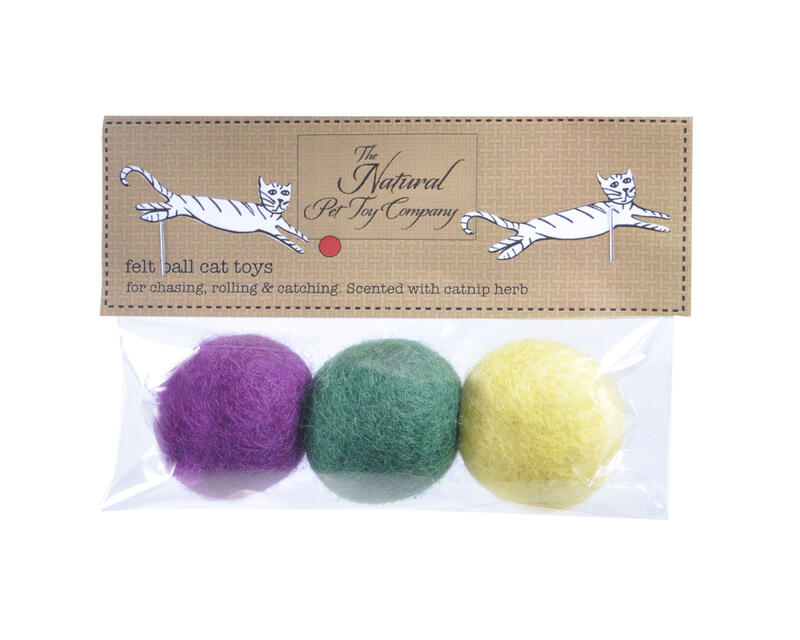 The Natural Pet Toy Company have developed these bright, colourful and natural felt ball cat toys. 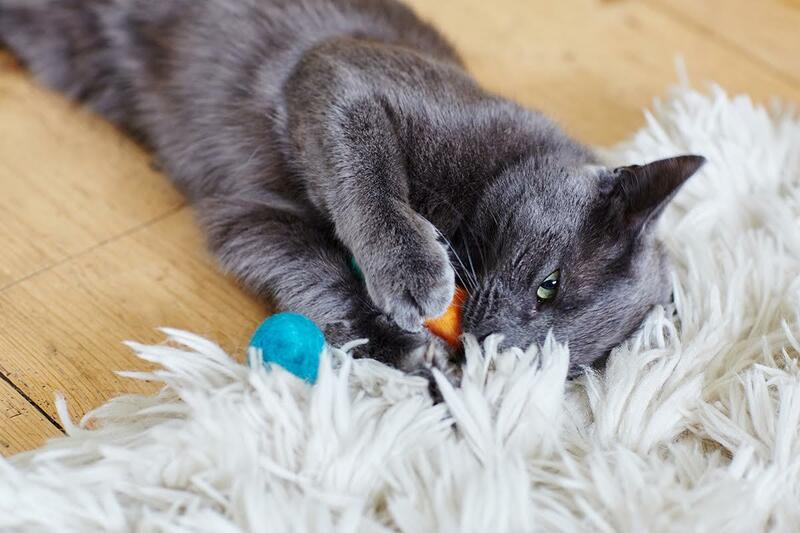 In a pack of three assorted colours and handmade from the softest merino wool, these luxurious cat toys are lightweight and naturally bouncy, so perfect for your cat to roll, chase and catch. Such a great size/weight for kittens to bat around - one kitten loves these balls so much that when he is too tired to chase it any more, he picks it up in his mouth and curls up with it. Great service, as usual. It is the first time I have bought these, all the cats were interest but the female preferred these to the Rabbit catnip toy, which says something. It was great watching her fling them around and catch them, she became very defensive of them, so the boys didn't even get a look in, will definitely be getting more. He is not as thrilled by this, but I'm sure a younger cat would be. This is the second time we have bought these for our cat shadow. He absolutely adores them and will happily just play fetch with us for hours. Foster kittens love chasing these things about, big hit! I thought these were lovely, but the cats prefer the normal catnip mice! Ordered some more mice at the last minute before Christmas and the service from the Natural Pet Toy Company was excellent - as usual- they arrived just in time. Happy New Year. First time purchase and did not disappoint. The cats love them! Light and speedy across the floor, best ball toys i got!!! Although these Christmas presents have yet to be opened, I know my two cats will love them. 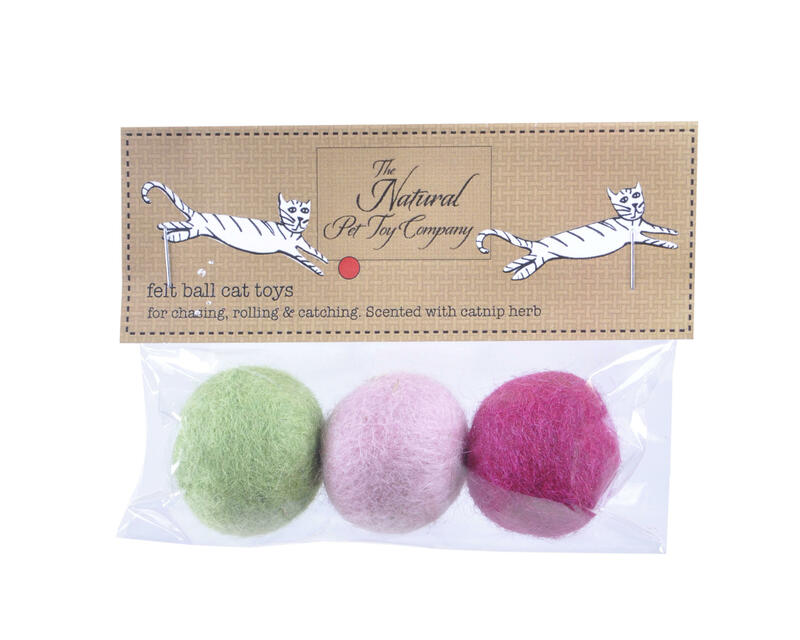 This is the first time we have bought these little felt balls but if they are the same high quality, filled with catnip as the other toys, they will go down a treat with Uggs and Dolly Jean! Merry Christmas! These wool balls drive our cats potty and keep them occupied for hours. Another excellent product from the Natural Pet Toy Company. They keep my two Korats occupied ...quite some achievement,if you've ever owned any!!! Supervised play only,please do not leave them out unattended! Good quality as are the catnip mice and fish I have always bought. Really are the best on the market and well worth the price especially when 3 for £10.00! Lovely rolly, catnip scented balls. First time I have purchased these. Cat can get his claws into them and roll around. Haven't tried this product before. The balls are the perfect size and softness for feline paws to bat them around. The only thing is they are also the perfect size to get stuck behind and under furniture so ours are temporarily missing in action. I'm sure they will turn up somewhere though - unless they join the land of missing socks! Thank you. Tara loves her felt balls. We definitely be buying more. Something different for little paws. Not had these before but like all your other toys, an instant winner. Excellent product. The balls are really light and ideal for our cats and kitten to chase around. Our 5 month old kitten has not stopped playing with them since I opened the pack!! Once again my cats are very happy with their catnip presents. These are new to my cats, but along with your catnip mice, these were pounced upon as soon as I opened the envelope! The two little ones love these.Lots of freaking out in the early hours. A new hit in our house! Have been buying the cat nip toys for years and they never fail to entertain the humans and cats in our household, in equal measure! Fabulous quality, the best cat nip toy in the UK. Fantastic product and fantastic company. My cat loves all the catnip toys that I buy him and the delivery is so quick. I love the way Malcolm throws his ball in the air and catches it, he will play with it for hours. Great product as they all are. Our persian girls just love these, brought some at the supreme cat show in November they played with them so much that they have lost them! So hence another purchase! They seem to prefer the brighter colored ones! We really love these! You can kick them around like a ball, but carry them around in your mouth like a catnip mouse...and no annoying sound effects like other balls on the market! Come in a highly convenient pack of three... One each...thanks mum! Our new kitten Callie Siamese/bengal cross loves playing with these colourful balls. The balls are light enough for her to chase them all over the house and she carries one in her mouth when she wants us to throw it up the stairs for her to chase. My cat hasn't played with these as much as the catnip rabbit I bought together with them - this might be more due to her personality (she is not so into independent play) than any flaw with the toys. They are beautiful and high quality so I don't regret buying them! Another great success! The cats love these, good size for chasing, carrying & generally causing chaos! My 3 cats will play for hours with these, more than any other balls we've ever bought them. We're finding them everywhere, which means they are truly being enjoyed! My cats loved these but only for a short time. They prefer their other ones which contain catnip. I bought these to entertain, Charlie, our young cat, but he didn't get a look-in once 18-year-old Flad got hold of them. Although arthritic, he ran, jumped and chased one of the balls all over the kitchen, intoxicated by the intense, high quality catnip scent. The balls are a total success and our elderly cat is rejuvenated! Our new rescue cat loves balls but is not a big fan of catnip, or so we thought! She likes to play in the middle of the night & we can hear her chasing and chattering to these every night. Her favourite toys ! She also likes to chew the ears off the catnip mice. Not the same initial reaction as with the catnip mouse, did not go all gooey and could not pull the string etc. However, come morning no sign of felt ball! Rather worried that it had been eaten as we remembered she had tried to bite it, then we found it under some furniture. Obviously plays with it at night and our hunt continues each morning! 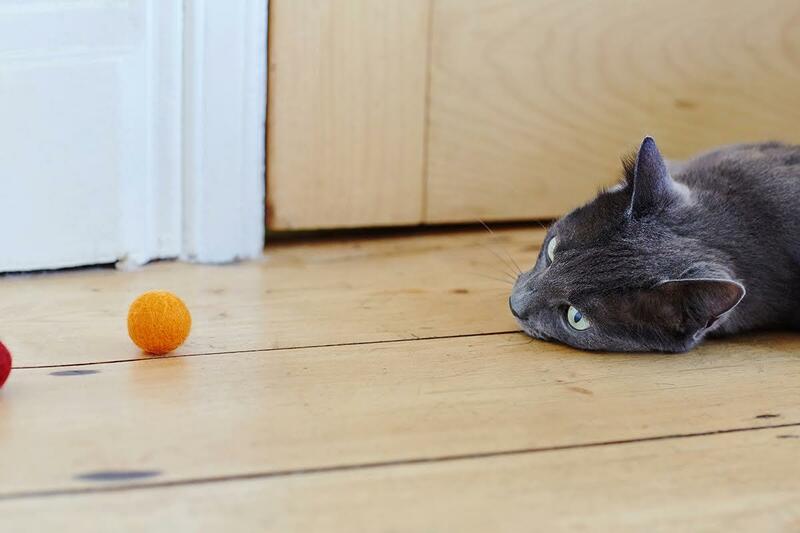 Our cats love playing and these balls are easy to bat ( and hide). Well our new arrival, Marley, arrived today. Coco wasn't at all happy and there is hissing. 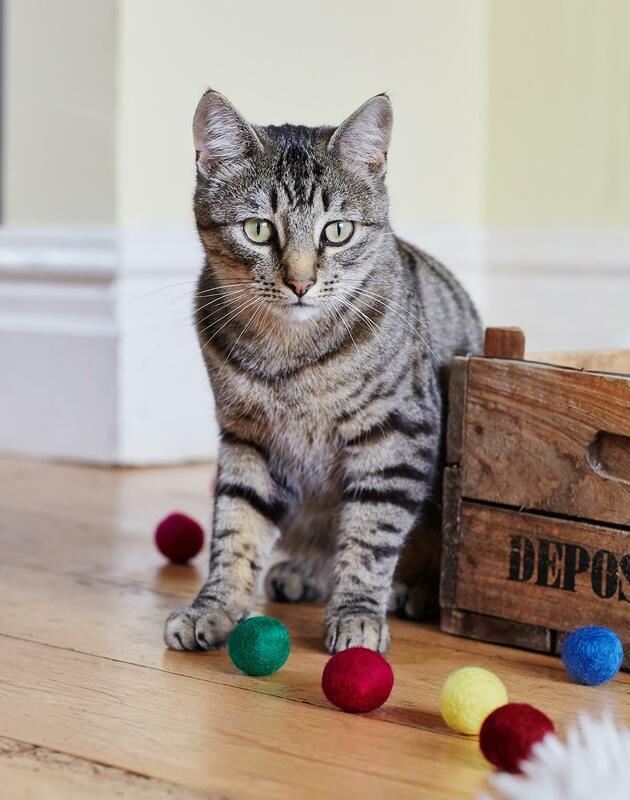 When Marley was let loose with these lovely balls, he chased them all over the room. Now we are having to find them again for him, but he sure does love them. Really lovely to see him play with a very safe good quality toy. I can recommend these! Enjoy!